Total Weight Loss with hCG: 44 lbs! Nisa had a radical hysterectomy in 2013 and she’s currently taking bio identical hormones. She is also diagnosed with hypothyroidism and currently taking 2 thyroid medicines. I’m 45, 5’3″, and I had a radical hysterectomy in 2013–which means they took everything out, and I take bio identical hormones via pellets that are inserted under the skin and last for 4 months. I’ve been diagnosed with hypothyroidism and am currently taking 2 different thyroid medicines. I’ve dealt with anxiety and depression for most of my life. How much weight you’ve lost with hCG/starting weight/ending weight/ clothing size change. I started off at 189/190 and gained only a pound after loading during my first round. I was pushing a size 18-20. I did 3 rounds; one 30 day, one 23 day, and my last one was 4 weeks, so is that 28 days? Lol! I am now in a size medium or size 8. I do have a pair of size 6 jeans I am wearing, but I wouldn’t say I could fit in ALL size 6’s. As of the interview, I will be in Phase 4; currently I’m on day 15 of Phase 3 and am maintaining successfully! I’m actually a bit below my LIW, but we shall see as if interview time! I have struggled with eating disorders for all of my teenage years and most of my adult life. From bulimia to binge eating disorder, I’ve just never had a healthy relationship with food. It was either the enemy or my best friend. In my mind, I had always struggled with my weight and was overweight; but earlier this year, when I was at my highest weight, we were watching old family videos and I saw how thin I was. It dawned on me that, back then, I saw myself as big as I was at my highest weight. It opened my eyes to how distorted my view of my body was. I would say the real struggle with my weight began after I had a partial tummy tuck. Oddly enough, I immediately began to gain weight after the surgery. I went from 120 lbs to 155 in a matter of months; then became pregnant with my 5th child at the age of 36. I ended up having to be on complete bed rest and my weight ballooned to 200 lbs. When I had my daughter, I would diet on and off, but always included starvation and ridiculous amounts of cardio. I couldn’t maintain the weight loss, because I would always end up gorging. I would even sneak into the closet and eat whole bags of candy. It was bad. Finally, after we had moved for my husband’s job to another state and we’re preparing for my 2nd daughter’s wedding, my eyes were opened to my size and that things were out of control. I felt like I had tried everything and maybe weight loss surgery was my only answer. 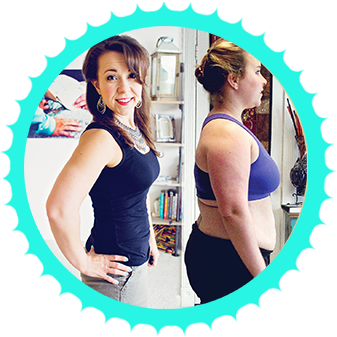 THEN, I stumbled across your videos and your blog, and I began to feel that maybe hcg injections would work for me. I had tried the homeopathic drops several years prior and I HATED how I felt–starving and depressed, so my view of hcg up until hearing your experience was a negative one. I used the opac and did injections. Surprisingly, I found it to be relatively easy! I was pleasantly surprised by that. I loaded like a full out gorging, lol! I ate anything and everything that was fattening and or bad for you! Of course, my 2nd day of loading was miserable because I had to basically force myself to eat. All that, and I only gained one lb! So, for me, P2 was easy because it was so cut and dry. I had to play around with quantities and fruits, and had some very frustrating moments when I seemed to gain for no reason, but overall, I’m super happy with my results, not just physically, but psychologically. I would mostly eat chicken or tilapia with cucumbers. Occasionally I’d have spinach or lettuce, but it was hard to eat dry and I don’t really care for apple cider vinegar, so no “dressing” was tough. I actually went through my daughter’s rehearsal dinner, wedding and then one of my close friend’s wedding while on phase 2! I just kept my eye on the prize. I was losing and I knew what happened when you cheated because I had done enough research. I was just determined. AND I didn’t want to prolong the process by cheating. I definitely learned to take it slow! I ended up having to do steak days for my 1st 2 rounds but for this phase 3 I’ve been good. Just adding things SUPER slowly and being really tuned in to my body after adding something like almonds or cheese. I was super slow even adding cauliflower or broccoli. I stayed away from processed foods and anything with too many carbs. NO SUGAR! And definitely NO GRAINS! Cheating, definitely, or a focus on how “hard” it is. I think everyone has their own unique experiences, but I find the people that do best or have the most success, have their minds made up for change. They’re ready to focus on changing their entire lives, so this is just a short term thing they have to go through to change their lives permanently for the better. I would say stick to protocol as closely as possible. I know there are rogue things that work for others, so I wouldn’t say don’t try those “safe” rogue things, but if you stick to protocol you’re definitely safer. Also, make up your mind before you start that this is only a few weeks out of your life. Just find that part of you that is strong and ready to change. That determination. No cheating! Before you start determine that you will.not.cheat.